Probably the most well known, and definitely the most infamous hill walk in the Lake District is the climb of Helvellyn via Striding Edge. 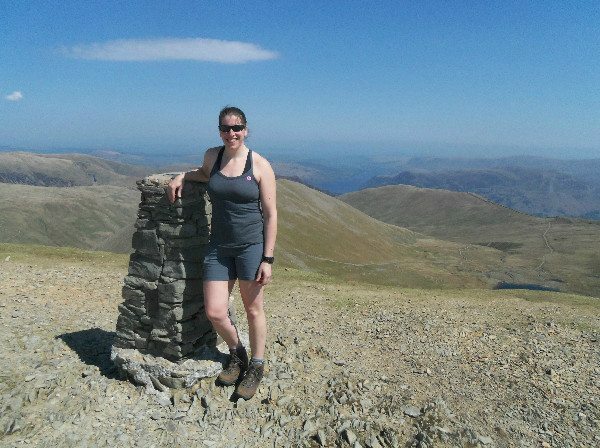 Whilst commonly described by guide books as being of no great difficulty to the seasoned hill walker, Striding Edge actually claimed 5 lives during 2015. Understandably, this has led to the route having a fearsome reputation, and many walkers simply won’t attempt it. But is this reputation justified? At this point I should probably admit that I have climbed Striding Edge once before several years ago, and have subsequently always been in the “it’s not nearly as bad as people say” camp. Rebecca, on the other hand, had only heard the horror stories. There was only one way to find out – climb it! The warm weather of early May was particularly welcome after the appalling winter we’ve had, and it had the effect of ridding the hilltops of the heavy snows that had fallen only a couple of weeks earlier (I know I said Striding Edge wasn’t that bad, but that doesn’t mean I want to climb it in snow!) That meant the route was all set to be dry and warm, with the main threat coming from sunburn rather than perilous cliffs. We parked in Glenridding and headed out under blue skies to the start of our climb, which would take us up the path alongside Mires Beck and onto Birkhouse Moor. 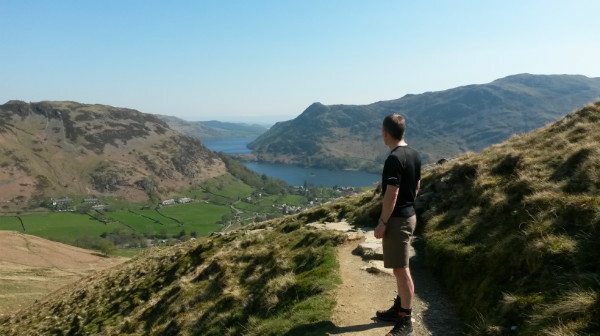 The path climbs steeply and fairly relentlessly, but all the while fabulous views along the length of Ullswater open out below, with the bulk of Place Fell (657m/2156ft) initially filling the skyline to the east. Eventually, a high saddle of flat land is reached, providing some needed respite along with the first views of St Sunday Crag (841m/2759ft) which runs parallel to our walk on the other side of Grisedale to the south. The path climbs more gradually to the shoulder of Birkhouse Moor, at which point a short detour (which we didn’t take) takes you to the summit cairn at 718m/2356ft. And it was at this point that we first encountered the wind. What had been a gentle, if slightly gusty, breeze at lower levels suddenly started to take on a slightly more aggressive tone. Fortunately, the path soon starts to run alongside a high stone wall that provides excellent shelter and brings you to a point known as the “Hole in the Wall”, where several paths converge for the final pull up to the start of the edge itself. You can also decide here how you want to tackle Striding Edge, as there are paths on either side below the ridge for those not keen on attempting the ridge line directly. By pure chance, we ended up using a combination of both. In good weather, the ridge itself doesn’t actually look that scary, so long as you can cope with the feeling of height and exposure. Whilst it most definitely is not a knife edge, it is narrow in places and the land falls away steeply on either side. In other words, if you fall here, there isn’t much to stop you. But for the sure-footed, there shouldn’t be much of a problem. Unless it’s windy. Because as we traversed the ridge, that wind suddenly became much stronger. In fact, occasional gusts were strong enough to push us slightly off balance – the last thing you want in a place like that! We therefore dropped down to a sheltered path just off the top, which made the going both easier and safer (it’s worth pointing out that we saw other more adventurous walkers coping perfectly well with the whole of the ridge line). Unfortunately, you can’t really stay low for the entire ridge, as the way to the summit of Helvellyn lies directly off Striding Edge. So we climbed back onto top for the last section, which also happens to be the trickiest. Unbeknown to us (and not remembered by me), Striding Edge ends with a feature known as “the Chimney”, which is basically a sheer jumble of rock around 7 meters tall which has to be climbed down before you can climb up again onto Helvellyn’s summit. This is the one place on the entire ridge where hands must be employed as well as feet. After negotiating the Chimney, there are again different ways to tackle the summit climb, which is steep and rocky, but not particularly long. The adventurous can attack the slope head on and climb straight up the shattered crags using hands and feet. For everyone else, a slightly easier path climbs to the left of the main crag, initially using steps built into the hillside and then following a scree covered track which winds up onto the summit plateau. And after the dramatic, rocky terrain on the approach, the summit is something of a surprise – a broad, flat plateau stretching into the distance to the north and south. So broad and flat that in 1926, test pilot Bert Hinkler actually landed a biplane here. 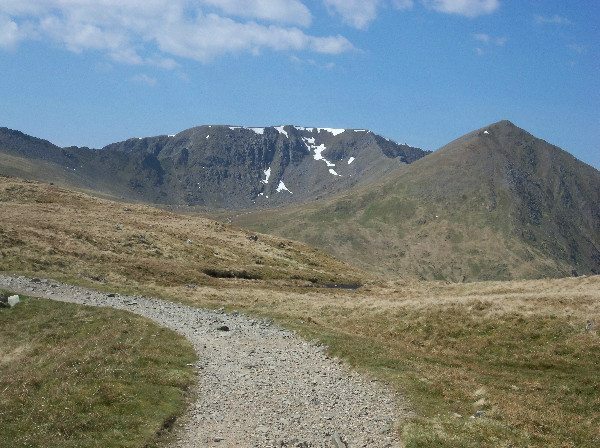 In fact, it is difficult to see exactly where the highest point of Helvellyn is, with a large cairn and trigonometry point, separated by about 200m, both vying for the title. The view from the summit is extensive – you are on the top of England’s third highest mountain after all. To the south, much of the length of Windermere can be seen stretching off into the near distance with Morecambe Bay glittering away towards the horizon. 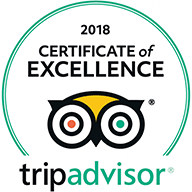 Coniston Water can be seen in its entirety trapped between hills away to the south west, whilst to the west, Crinkle Crags, Bowfell, Scafell Pike and Great Gable all stand proud amongst a jumble of smaller fells. To the east, the view looks over Red Tarn and Catstycam towards the Pennines, with the massive bulk of Cross Fell (the highest point of the Pennines at 890m/2930ft) towering over Penrith. Our route, however, took us along the summit ridge to the north, crossing first Lower Man (925m/3035ft) and then White Side (863m/2831ft), with superb views opening up to the north west of the Skiddaw massif, whilst Thirlmere appears some 2000ft directly below at the foot of Helvellyn’s steep western buttresses. At the saddle between White Side and Raise (the next top in line at 883m/2897ft), a wide path leaves the hilltop and descends gradually towards the head of Glenridding (the valley), and the disused workings and buildings of the Greenside mine, some of which have been renovated for use by the national park authority. From there, it’s an easy walk back to Glenridding (the village) along a wide track running along the gorse filled hillside, with Glenridding Beck and sheep pastures below to the right. 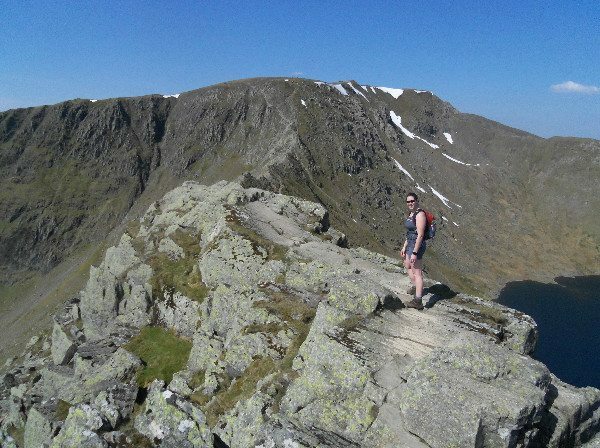 So is the fearsome reputation of Striding Edge justified? Probably not, but neither is it the sort of route that you would want to do in bad weather, particularly with strong winds or ice on the ground. But in decent weather, so long as you are sensible, it really isn’t a difficult route. And it does provide a rare (for the Lake District), if small, hint of Alpine style scrambling. Our route was around 14km/8.7miles, and took us approximately 5 hours, including stops, starting and finishing at the main National Trust car park in the centre of Glenridding.